The World Trade Organization slashed its global trade growth projection for 2019 to the lowest level in three years, citing the impact of rising commercial tensions and tariffs. World merchandise trade growth will slow to 2.6 percent this year and 3 percent next year, after notching 3 percent in 2018, the WTO said in a report published Tuesday. In September, the WTO said trade would increase by 3.9 percent in 2018 and 3.7 percent in 2019. The reduced forecast for 2019 marks the second consecutive year the WTO has pared back expectations and broadly reflects similar readings from the World Bank and the International Monetary Fund. The revised figures provide an important gauge of the stakes involved in President Donald Trump’s economic fight with China nearly a year after the initial salvos of the trade war were fired. The report comes as Chinese Vice Premier Liu He visits Washington to continue talks aimed at ending the U.S.-China tensions. Central bankers and other policy makers have long warned of the impact of trade tensions on sentiment. The OECD cut its 2019 global forecast last month and said a materialization of risks related to protectionism could mean even weaker growth. The IMF, which will update its outlook next week, downgraded its view in January, when it also warned that threats were on the increase. The WTO report cited various risks to trade growth including new tariffs and retaliatory measures affecting widely traded goods. The WTO said volatility in financial markets and tighter monetary conditions also weighed on global trade growth rates. GDP growth will slow from 2.9 percent in 2018 to 2.6 percent in 2019 and 2020, the report said, citing a consensus estimate from industry surveys. 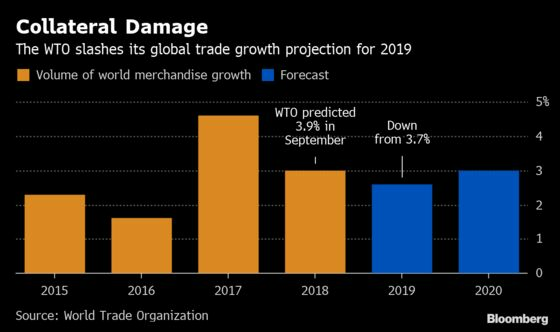 The WTO said the worst case scenario of a global trade war would lead to a reduction in world GDP in 2022 of about 2 percent and a reduction in global trade of about 17 percent compared to baseline projections. Under the WTO’s worst case scenario, international cooperation on tariffs breaks down completely and all countries set tariffs unilaterally.